Sharp’s next-generation full-colour MX-5070N is packed with state-of-the-art technologies that add new value to your workflow. Thanks to the user-friendly design of these MFPs—including a new Easy UI mode—a wide variety of users can access their advanced functions easily and intuitively. Adding one of these high performers to your talent pool is a great way to make your business grow. Transform the way you use information in your business by connecting one of these new MFPs to a variety of mobile devices and cloud services. Now you don’t have to be confined to the office—you and your team can work anytime, anywhere. 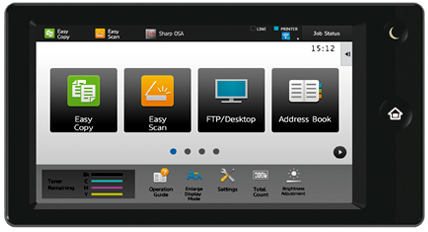 The amazing flexibility of these Sharp MFPs can help you grab new business opportunities and boost your bottom line. OCR allows users to convert scanned documents into editable common Microsoft® Office files (pptx, xlsx, docx) and searchable PDFs. 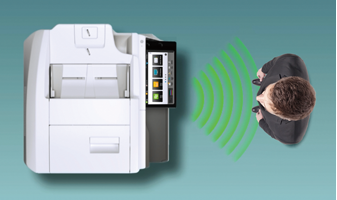 A motion sensor detects approaching users and wakes the MFP from Sleep mode, making it ready for immediate operation. Note: Detection range can be set to three different ranges. These MFPs fit securely and seamlessly into your office system. An advanced security environment and new, easily viewable administration tools reduce the workload for system administrators and give full support to their management duties.